This is where Wallace first discovered the Standardwing now named after him, but he may also have been the last person that visited this island! I went last year; inc saw standardwing, and saw guestbook showing several others had been to see this too. 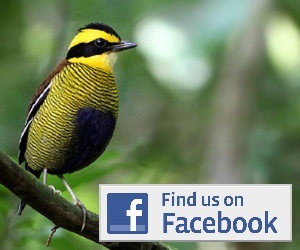 If you had any more info on birding in Bacan it would be great to update this page. Feel free to post it here, or send to info@burung-nusantara.org and we can add it. Just sent a bit of guff by email. Anyway, I’ve only done relatively casual birding there; went August last year, and back in Aug this year. Standardwing key aim last year; and taken to a lek on slopes of Gunung Sibela, south of main town, Labuha. Taken by Pak Kasman, who lives in village at foot of the mountain and sometimes takes people to the lek. Seemed area by it was good, inc Chattering Lories, Red-cheeked Parrot, Purple Dollarbird, Blyth’s Hornbills. Must be more to find there. Last month, also w Pak Kasman on jungle trek to place for butterflies; failed re golden birdwing [maybe as weather dull]; not many birds in great forest, perhaps as had been too much trapping. Also last month headed to waterfall place south of Sibela [a family holiday, with birding…]. Goliath Coucal while driving round slopes; heard White Cockatoo near the waterfalls. So based on casual visits, I reckon Bacan’s good for birds, and has more to offer. 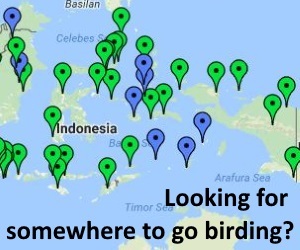 Not as easy or well known for birding as Halmahera. But one thing is that has better accommodation, restaurants etc in Labuha – a pleasant little town I reckon. So may appeal to some people. Myzomela on Sibela is likely a unique species, too; mostly at high elevations, hard to even get to the upper reaches; but Dillon Ripley had down to around 350m when some trees were in flower….